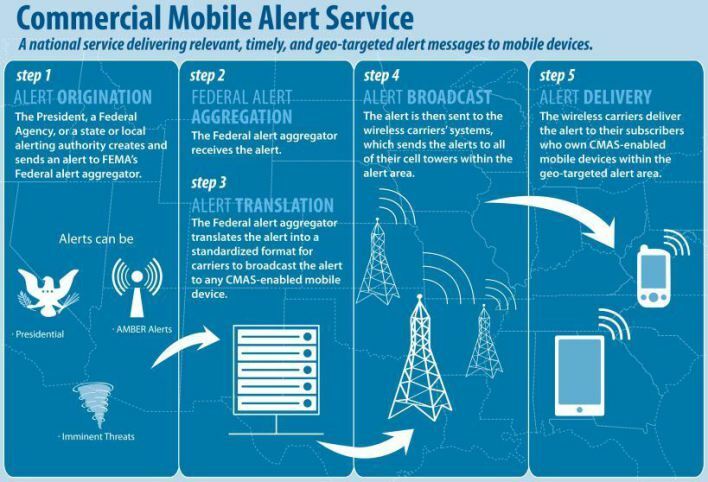 The Wireless Emergency Alerts (WEA), is also known as the Commercial Mobile Alert System (CMAS) or Personal Localized Alerting Network (PLAN). The system is a national emergency alert system to send concise, text-like messages to users’ WEA-capable mobile devices. The bill authorizing the WEA was signed into law in April 2012. All the major wireless providers signed-off (agreed) to participate in the emergency alert system. AMBER Alerts– Alerts that meet the U.S. Department of Justice’s criteria to help law enforcement search for and locate an abducted child. In a nutshell, if your phone is on, it is connected to the nearest cell phone tower it can find, and it will stay connected to that tower until the phone finds another tower that it thinks is closer. If a message needs to get sent out, the cell phone companies will send out the message to the designated towers and if your phone is connected to one of these towers you get the alert. One of the complaints of the messaging system is that it will alert you, with sound, even if your phone is on silent or vibrate (and the sound is loud). Furthermore messages can be sent at any time, 24 hours a day. One noteworthy alert in California, had an amber alert sent out in the middle of the night (about 2am or so) waking up and freighting a large number of people who were not expecting to hear that go off while they were asleep. In the following report by Tech Feed, Annie talks about the wireless alert system and the California alert and shows you some ways to opt out of the alerts. this is the screen where you can turn off Amber and weather notifications.